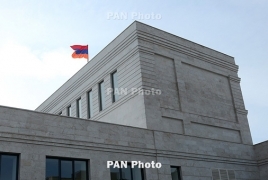 PanARMENIAN.Net - Certain agreements have been reached during German Chancellor Angela Merkel’s recent visit to Yerevan, acting press secretary of the Armenian Foreign Ministry Anna Naghdalyan told reporters on Tuesday, August 28. “Throughout the 27 years of diplomatic relations between the countries, this was the first visit at such a level,” Naghdalyan was quoted as saying by Aysor.am. According to her, the agreements reached at various meeting are related to investments and joint projects. Merkel arrived in Armenia from Georgia on August 24 and left for Azerbaijan the next day. When in Yerevan, the Chancellor met President Armen Sarkissian, Prime Minister Nikol Pashinyan, the Catholicos of All Armenians, Karekin II, as well as took a walk in downtown Yerevan and posed for selfies with young Armenians.